Here are a few tips to consider before you leave, while you travel, and after you arrive at your destination. Think about where you want to go and how you will get there. What is realistic? 1. Set reasonable expectations for your trip. It may not be possible to go for several weeks or to see every tourist attraction, but you can still have a fantastic time. It may require that you scale back and think about what is most important for you and your family member. 2. Will you be travelling by car or airplane? What is best for your loved one? Is it better to be in a car where you have control over how long it will take you to get somewhere, or should you just get to your destination as quickly as possible? 3. Will you be visiting family and friends? If so, are they aware of your loved one’s current condition and any changes since they last saw them? Call with an update so there are no surprises. Share any helpful tips or information on how to communicate or what they can do to help during the visit. 1. Pack a cooler with plenty of drinks and snacks. 2. Plan where your next rest break will be. 3. Have a playlist of music for a fun sing-along in the car! 1. Give yourself lots of time at the airport. You don’t want to rush your loved one trying to get through security or to the gate on time. Ask for extra assistance when you book your ticket. 2. Minimize the number of connections you will have to make. This will lessen the likelihood of disruptions, cancellations, and lost luggage. 3. 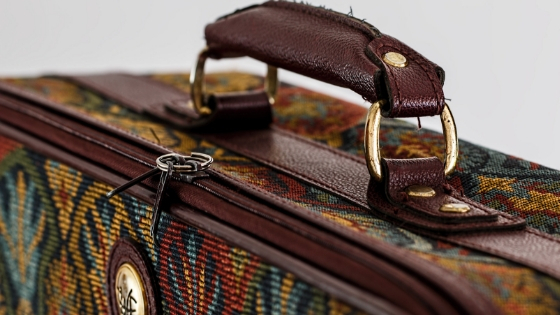 Pack valuables such as medications, identification, health insurance cards, doctors’ names and phone numbers, a list of medications, a recent photo of your loved one, and an extra set of clothing in your carry-on. Also, have a sweater as the airplane can be cool. 4. If your loved one enjoys music, have a playlist on your phone and a set of headphones for them to use. Also pack any items that will help them stay comfortable or that they enjoy like photographs or a book. 5. Have information about where you will be staying in your loved one’s wallet. 6. Be sure to drink lots of fluids. It is easy to get dehydrated especially when on an airplane. Seniors are very prone to dehydration so be sure to always have a water bottle with you and offer lots of sips. Always accept a glass of water from the flight attendant when it is offered. Now the fun begins! Before you hit the pavement running, expect that your loved one will be tired from travelling. 1. Give them a day or two to rest and get acclimatized to the new surroundings. Keep the first couple of days low key. 2. Keep the schedule as close as possible to what you do at home. Try to eat at regular meal times and go to bed at the same hour. 3. Leave the bathroom light on and keep the path to the bathroom unobstructed. 4. Don’t plan too many activities in one day. Schedule rest breaks. 5. Be prepared to make changes to your plan. It’s important to stay flexible. For example, maybe going to the zoo on a hot day isn’t a good day after all and you will have to cut the visit short. The most important point of a trip is for both the person with dementia and you, the caregiver, to enjoy yourselves! Make time spent with family and friends the priority and enjoy their company. Savor the little moments, take photos, and make new memories to bring back home for future reminiscing!